Large boulders create a wall for the water before reaching the beach at Katherine Cove in Lake Superior Provincial Park in Ontario, Canada. 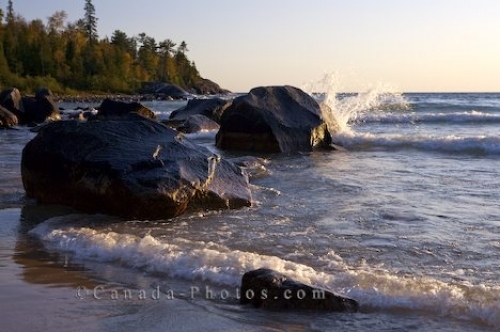 The waves can easily whip up on Lake Superior in Ontario, Canada when the wind blows hard causing the water to smash against the boulders which adorn the end of the beach at Katherine Cove. The water dampens the boulders as it crashes over top while the smaller boulders allow the water to swirl around them before it creeps up onto the beach. Tall green trees form themselves around the point leading to another beautiful location along the shoreline of Lake Superior. Beauty and tranquility is what one will find at Katherine Cove in Lake Superior Provincial Park in Ontario. Picture of the large boulders along the beach at Katherine Cove in Lake Superior Provincial Park in Ontario, Canada.